Animals need to eat enough food to provide energy to sustain their bodies, hunt, grow and reproduce. In a changing world, changes to the metabolic cost of life can influence where animals can live. To date, measuring the energetic cost of living in the wild has been difficult, especially for animals that live in water. However, new research has discovered that a fish's pace of life is recorded in a small structure in its inner ear, known as an otolith, or earstone. The carbon in the earstone originates from two sources: the water the fish lives in and the food it eats to meet its energy demands. The carbon from both sources mix in the blood before some of it ends up in the earstone as calcium carbonate. 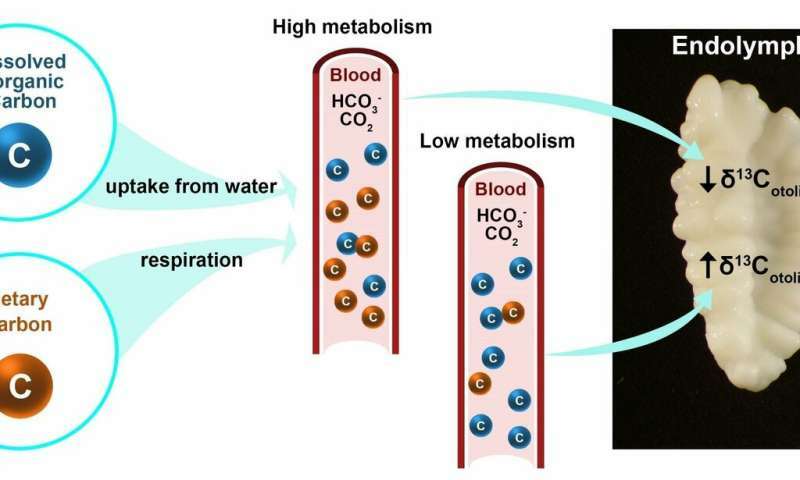 By carefully analyzing the calcium carbonate, the researchers can determine the how much of the carbon originates from the water or the diet as the two sources have different proportions of the light and the heavy carbon isotopes. When the fish's metabolism increases, for example when it encounters warmer water or is more active, it burns off more food and the proportion of carbon from the food in its earstone increases. Earstones grow new layers similar to the rings in a tree trunk. Every little increment in the otolith growth reflects the growth of the fish and can be used to document its age. This data can be recovered even after the fish has died. Now, by measuring carbon isotopes in the individual layers, the researchers can tell how the metabolism of a fish has changed on a monthly basis during its life, including how seasonal variations in temperature, food and the fish's behaviour have affected its metabolism. "Our new results is the key to a treasure chest of new discoveries", says Dr. Clive Trueman, from the University of Southampton, who is one of the co-authors behind the paper that is being published in the journal Communications Biology today. Dr. Ming-Tsung Ching, another co-author from Aarhus University in Denmark added "Now we have the tools to measure and understand how fish are being affected by and adapting to changes in the environment, and how much the fish must eat to gain enough energy to swim, grow and reproduce. This new tool will help us improve our predictions of what happens to the fish including commercially important fish like cod when the environment changes". "We can use knowledge about ancient fish metabolism to learn about the ability of the fish to adapt to environmental conditions that may come to exist in the near future, or how fish respond to changes in water temperature or food availability. What happens to the fish when the waters become warmer than they are now? ", says Prof. Grønkjaer from Aarhus University in Denmark. Dr. Trueman added: "We have already started looking into the metabolic rates of cod living in the cold, but warming waters, around Greenland. We have otoliths from fish in that region dating back to 1926 which will help us understand the impact of climate on the well-being of these fish. "Otoliths are like the black box of fish, they contain an enormous library of information written in a language that we are now starting to decipher."